Do you feel like the days just fly by? School, work, sports, extraciriculars, homework, housework… goodness I know our days just fly by. 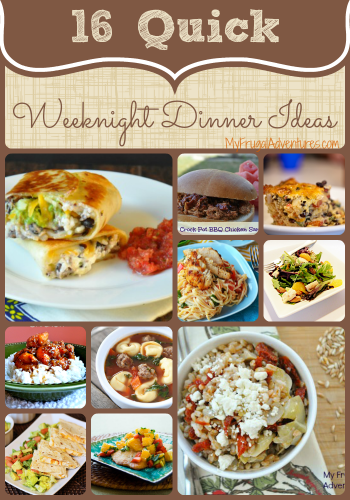 So I thought it might be nice to put together some quick and easy weeknight dinner ideas. Cilantro Garlic Chicken Quesadillas by Is This Really My Life? Hopefully this gives you some ideas for meals this week- I did try to find stuff that would be pretty kid friendly. You can see my Pinterest board for tons more recipes! Great list! Thanks for shout out! Thank you so much for featuring my quesadillas. Everything looks delicious! Thanks for the dinner ideas. I think you eat vegetarian. Do you know a list of vegetarian meals that are kid friendly and nutritious? List does not need to be as long but would be very appreciated. Have you tried the crock pot marinara sauce? Oh this list sounds great! Thanks for including my bruschetta chicken pasta in the mix! Thanks so much for including my recipe, #7 in your round-up. What a helpful round-up for all of us busy folks. Thanks!